There are some who would say you haven't really been scuba diving if you don't have the rad parrotfish pictures to back it up. Enter the waterproof camera. Waterproof cameras let you capture every moment of your Jacque-Cousteau-meets-Lara-Croft-style adventures — or simply take some adorable snaps of your kids at the water park. They can keep your gear dry in the watery depths of Lake Victoria or the torrential rains of Seattle in March; they keep the dust and dirt out, too. Some even protect against drops and minor scrapes. Canon has been a leader in the camera industry since the 1940s. Founded in Japan in 1937, it's guided by the San-ji, or "three selfs," spirit: self-motivation, self-management, and self-awareness. Learn more about how Canon's decades-long commitment to responsible advances in technology can help you prove you really did befriend a manta ray in Belize last summer. What does "Its associated camera" mean? Good question. In considering a waterproof case's associated camera — a.k.a., the camera that it's specifically designed to fit — we primarily reviewed its portability and overall performance. More to the point, we were looking for cameras that packed a lot of power and high image quality into a compact, portable, easy-to-travel-with design worthy of investing in a waterproof upgrade. When it comes to Canon waterproof cameras, the D30 is an oldie, but a goodie. It's also the only dedicated waterproof camera that the company currently manufactures. In other words, this heir to the D10 and D20 models is not a waterproof case for your existing camera; it's a compact waterproof camera specifically designed to hold up to whatever your vacation, archaeological dive, or Jaws-themed birthday party throws its way. The PowerShot D30 may be the elder statesman of the snorkel-friendly camera set, but it's endured this long in large part due to its outstanding toughness and ease of use. It's waterproof up to — okay, technically down to — 82 feet (25 meters) and shockproof up to 6.5 feet (two meters). It can handle temperatures as high as 104ºF and as low as 14ºF. Its oversized controls and comfy ergonomic design make it easy to operate under a variety of conditions, as well, including when you're wearing gloves. Grabbing video is a snap, too, thanks to the PowerShot D30's dedicated movie button. It records 1080p HD video at 24 frames per second and 720p HD video at 30 frames per second. If you're the family's budding James Cameron, know that it can also record slow-motion footage at 640 x 480 resolution. If you're simply the family's unofficial photographer, the PowerShot D30 includes a bevy of fun features to nourish your creative energy. There are more than 20 shooting modes, including Fisheye Effect, Color Swap, Long Shutter, and Underwater Macro. In addition to adjustable contrast, sharpness, saturation, and RBG values, there are also a dozen different photo effects at your disposal, including sepia tone and positive film. Built-in GPS allows you to add geotags to both photos and videos. A self-timer ensures you can even get in the shot once in a while and proves you were there, too. While the PowerShot D30 is a durable, easy-to-handle waterproof camera, its image technology has certainly grown dated in recent years. Its 12.1-megapixel CMOS sensor and DIGIC 4 processor have both been surpassed by the competition. Its detail levels and white balance are great, but you can expect considerable amounts of noise at ISO 400 and higher. The camera also lacks built-in WiFi. 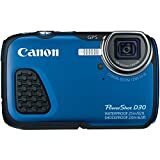 All in all, the PowerShot D30 is a sturdy, user-friendly waterproof camera that's wonderful for beginners and won't break the bank. It's comfortable to hold, intuitive, and easy to operate in both phone and video modes. Its Sunlight LCD mode even reduces monitor glare, too, making it easy to frame the perfect pic of your son, spouse, or that giant tortoise that's tailing you back to the resort. Includes extra neck strap, wrist strap, and silicone grease. The WP-DC56 waterproof case makes Canon's most impressive compact camera even more versatile and indispensable than it already is for the intermediate photographer. The G1 X Mark III packs a huge punch — and a huge 24.2-megapixel CMOS (APS-C) sensor — into a petite body that's easy to stash in a pocket or bag full of beach towels and sunscreen. It features dual pixel CMOS autofocus, an EVF electronic viewfinder, built-in WiFi, and a 3-inch vari-angle LCD touchscreen. In short, the G1 X Mark III fits all the power of an interchangeable lens camera into a tidy, portable package. It shoots movies in 1080p HD, too. This isn't a camera for beginners, however, and it has the price tag to match. It's a thoughtful purchase, and the WP-DC56 waterproof case, which comes with a neck strap, wrist strap, and silicone grease, will make your investment stand up to water up to 130 feet (40 meters), as well as dustproof. Its lightweight, clear body is built from a durable plastic polymer and features a built-in flat lens port. It also comes equipped with a diffuser for the G1 X Mark III's built-in pop-up flash, and its custom design lets you change almost all the camera's settings — such as zoom, shooting mode, and exposure level — with ease. The Canon PowerShot G7 X Mark II is another compact digital camera that can easily be made waterproof with the addition of a matching waterproof case. In this instance, that's the WP-DC55 case, which will make your G7 Mark II waterproof up to 130 feet and comes packaged with a neck strap and silicone. The camera itself is a more budget-friendly option than the PowerShot G1 X Mark III, its peer in portability. It's perfect for travel and features a 20.1-megapixel CMOS sensor and DIGIC 7 image processor. On the whole, however, it offers fewer features than other cameras in its class, and one of its most unique features is negated by the addition of a waterproof case: its movable display. The 3-inch LCD TFT color monitor on the G7 X Mark II can be flipped up for selfies, as well as tilted down. Of course, when the monitor is safe and dry and set firmly in place behind the WP-DC55 case, high- and low-angle shooting on the fly won't be an option. Still, this camera and waterproof case combo remains an attractive option for the beginner to intermediate photographer looking to take her or his skills underwater thanks to the camera's high-quality image output and the case's sturdy construction. It features clear, plastic polymer housing guaranteed to keep the G7 X Mark II dry, as well as a flat lens port. The WP-DC55 also includes a diffuser to temper the camera's built-in flash and comes with a fiber optic connector and cover attachment for an external flash. Canon offers a variety of waterproofing options for the photographer on the go, be it camera or case. Before you invest in any waterproof camera, it's a good idea to take stock of what you expect to use your gear for to choose the type of camera that will best meet your needs. There are three types of waterproof camera: compact, mirrorless, and DSLR. Each has its pros and cons; which one is right for you depends primarily on your goals, your comfort level as a photographer, and your budget. As their name implies, compact cameras are smaller, which makes them ideal for tossing in your backpack and easier to dive with thanks to their lightweight. It also translates to less drag underwater. On the downside, their small size often equals less battery life, less control over depth of field, and a smaller sensor, which means “noisier” photos and reduced dynamic range. More experienced photographers should likely look for compact cameras that offer fully manual controls and the ability to shoot in RAW mode. In addition to their portability and ease of use, compact cameras are the most affordable underwater option. Mirrorless waterproof cameras are also exactly what they sound like; they lack the internal mirror of a DSLR camera, which means they're smaller in size, but they can still produce high-quality images. They have larger sensors than compact cameras and can focus faster, too, making them the middle ground between a compact camera and a DSLR in terms of performance and price. If you want the best image quality, the fastest focus, and a buffet of lens options, then a DSLR waterproof camera is an attractive option. Compared to compact and mirrorless cameras, DSLR cameras offer more dynamic range, feature better auto-focus, and can capture fantastic photos in the kind of low-light conditions you'll find the further you get from the surface — down where only the most photogenic sea creatures hang out. DSLR waterproof cameras are powerful and pricey. Aside from camera type, one of the most important things to look for in a waterproof camera is its durability. Sure, image quality and features are important, but remember what you're going to be using it for and where. This isn't the camera you'll take to your daughter's graduation — unless, of course, the ceremony's taking place on the side of a rugged mountain somewhere near Nepal. In searching for a waterproof camera, look for one that can stand up to whatever you plan to put it through, whether that's deep water, sand dunes, or freezing temperatures. Many waterproof cameras are also dustproof and shockproof, the latter being a feature that's equally valuable at a Himalayan graduation ceremony or just hanging around the backyard pool.